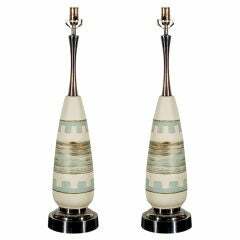 Vintage lucite table lamps with updated hardware, silk twist cord and custom silk shades with diffusers. Offered at . 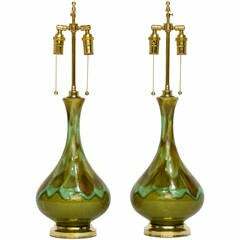 Green glazed ceramic lamps with solid brass hardware. Restored and rewired. Ceramic snail lamp with new shade. Table lamp, circa mid-20th century. Vintage ceramic lamp with unique coloring and texture. Wired to US standards. Shade not included.